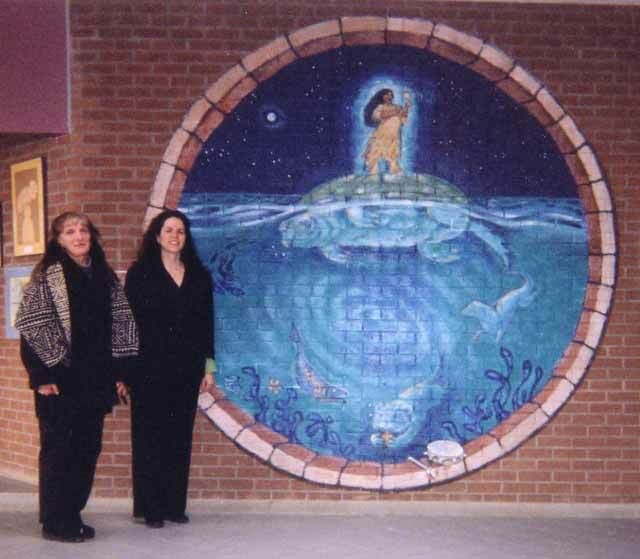 Stepping back – at Quinte Mohawk Federal school with Kathleen Manderville (principal) on Tyendinaga Territory very grateful to her and the community for bringing me onboard to paint many murals of the Mohawk traditions, in the foyer, the Gymnasium, the hallways and even surrounding a skylight. Though taking direction from traditional people, I was given much freedom to interpret from my own inspirations as seen in this small mural of the Sky Woman. 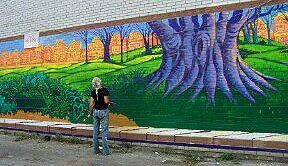 I painted there in 2005 then for the summer in 2007 and again in 2012. You can view the whole collection in my gallery called school murals and sample murals.